Secretary of State for Northern Ireland, Karen Bradley pictured in the Dome of Victoria Square shopping centre last week. 'Photo: Colm Lenaghan/Pacemaker. Karen Bradley has committed to provide budget clarity for Northern Ireland’s public services. She declined to immediately reimpose direct rule from Westminster and raised the prospect of calling another Assembly election. The Northern Ireland Secretary has come under pressure from the DUP to appoint ministers to take decisions on schools and hospitals and pass a budget before they run out of cash. It is 13 months since powersharing collapsed at Stormont in a row over a botched green energy scheme. Senior Democratic Unionist Nigel Dodds said it was a “dereliction of duty” to continue without a spending plan or ministers to make decisions. Ms Bradley said she was working to ensure budget certainty for civil servants and she would return to the House of Commons. She also told the Commons fresh elections to the Northern Ireland Assembly could be called if all other viable options were exhausted. The Northern Ireland Secretary said the Government will not shirk its responsibilities. 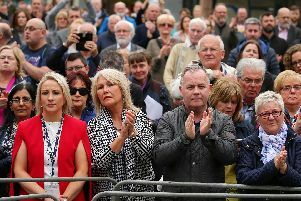 Ms Bradley also said it was the Government’s view that both the DUP and Sinn Fein “participated in discussions seriously and in good faith,” and that “progress towards reaching agreement on all the key substantive issues has been made”. Sinn Fein opposes the return of direct rule and has called for an intergovernmental council involving the Irish Government to consider the issue. Dublin has said it wants to protect the Good Friday Agreement and the British Government has echoed that stance and said it believes in devolution. Prime Minister Theresa May is due to meet the leaders of the DUP and Sinn Fein at the House of Commons this afternoon (WED), Downing Street said.